For other uses, see Polity (disambiguation). In geopolitics, a polity can be manifested in different forms, such as a state, an empire, an international organization, a political organization and other identifiable, resource-manipulating organizational structures. A polity, like a state, does not need to be a sovereign unit. The most preeminent polities today are Westphalian states and nation-states, commonly referred to as "nations". It therefore encapsulates a vast multitude of organizations, many of which form the fundamental apparatus of contemporary states such as their subordinate civil and local government authorities. Polities do not need to be in control of any geographic areas, as not all political entities and governments have controlled the resources of one fixed geographic area. The historical Steppe Empires originating from the Eurasian Steppe are the most prominent example of non-sedentary polities. These polities differ from states because of their lack of a fixed, defined territory. Empires also differ from states in that their territories are not statically defined or permanently fixed, and consequently that their body politic was also dynamic and fluid. It is useful, then, to think of a polity as a political community. A polity can be defined either as a faction within a larger (usually state) entity or, at different times, as the entity itself. Kurds in Iraqi Kurdistan, for example, are parts of their own separate and distinct polity. They are also, though, members of the sovereign state of Iraq which is itself a polity, albeit one which is much less specific and, as a result, much less cohesive. It is therefore possible for an individual to belong to more than one polity at a time. Thomas Hobbes was a highly significant figure in the conceptualisation of polities, and in particular of states. Hobbes considered notions of the state and the body politic in his most notable work, Leviathan. In previous centuries, body politic was also understood to mean "the physical person of the sovereign:" emperor, king or dictator in monarchies and despotisms, and the electorate in republics. As many polities have become more democratic in the last few centuries the body politic, where sovereignty is bestowed, has grown to a much greater size than simply the ruling elite, such as the monarchy. In present times, it may also refer to the representation of a group, such as ones drawn along ethnic or gender lines. Cabinets in liberal democracies are chosen to represent the body politic. ^ See: Black's Law Dictionary, 4th ed., West Publishing Co., (1968), and Uricich v. Kolesar, 54 Ohio App. 309, 7 N.E. 2d 413. 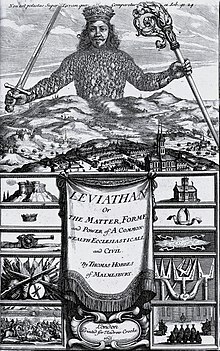 ^ Thomas Hobbes, Leviathan, (1651); http://www.earlymoderntexts.com/authors/hobbes; accessed 25 February 2016. Look up polity in Wiktionary, the free dictionary.